The Webino™ architecture is event driven, thus extensible. We can attach listeners to events, performing other operations as they trigger. The basic idea around events is that we just trigger an event and every action happens in listeners, even the main action. 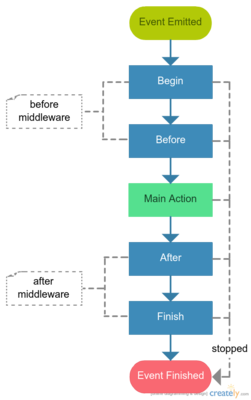 Then we can listen to that event using priorities, if we want to act like a middleware. The event propagation could be stopped at any time. Using events like someEvent.pre and someEvent.post or someEvent.before, someEvent.after, it doesn’t matter, is messy and not recommended, don’t do that. Give an event a unique name then attach listeners using priorities. Convenient way to do that is to use an event priority constants. The event listener is a callable piece of code that can perform actions when event is emitted. It is allowed to register an event listeners in some different ways. The closure listener is the fastest created listener, but not the best practice at all. The invokable listener is a class that its object can be called like a function. The listener aggregate is a class that registers other listeners in a batch. Registering listener aggregates via application config. Core listeners can even listen to the application bootstrap first pass and configure events. They are registered into the core configuration and they can modify application configuration. Only core services are available to core listeners before application is fully bootstrapped. Registering core listener aggregate via application config.